Are you an educator interested in graduate school with a love for the Constitution? 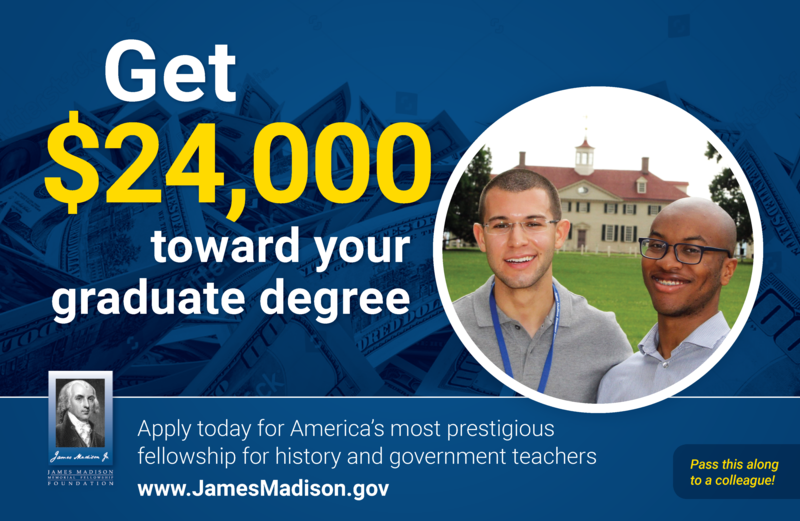 Apply for the James Madison Foundation’s Graduate Fellowships! One individual per state per year can win $24,000 toward becoming teachers of the American Constitution at the secondary school level. Graduate fellows can choose their own university and program of study and will also be attendees of an all expenses paid four week summer institute in Washington, D.C. The summer institute brings together an elite group of scholars who encourage a spirit of inquiry and discovery that James Madison fellows will eventually bestow on their own students. Upon completing a master’s degree in history, political science, or education, graduates will go on to use their skills as social studies teachers. Applications are due March 1, 2018. Find more information and the application at the James Madison Foundation website. The James Madison Foundation’s mission is to encourage study of the United States Constitution, its roots, its formation, its principles, and its development. Created by Congress in 1986, the Foundation is an independent agency of the Executive Branch of the federal government. Are you an educator interested in graduate school with a love for the Constitution? Apply for the James Madison Memorial Fellowship Foundation’s Graduate Fellowships! One individual per state per year can win $24,000 toward becoming teachers of the American Constitution at the secondary school level. The James Madison Memorial Fellowship Foundation’s mission is to encourage study of the United States Constitution, its roots, its formation, its principles, and its development. Created by Congress in 1986, the Foundation is an independent agency of the Executive Branch of the federal government.